Building an Entry Way Table- How My Entry Went from Drab to Fab in a Day! 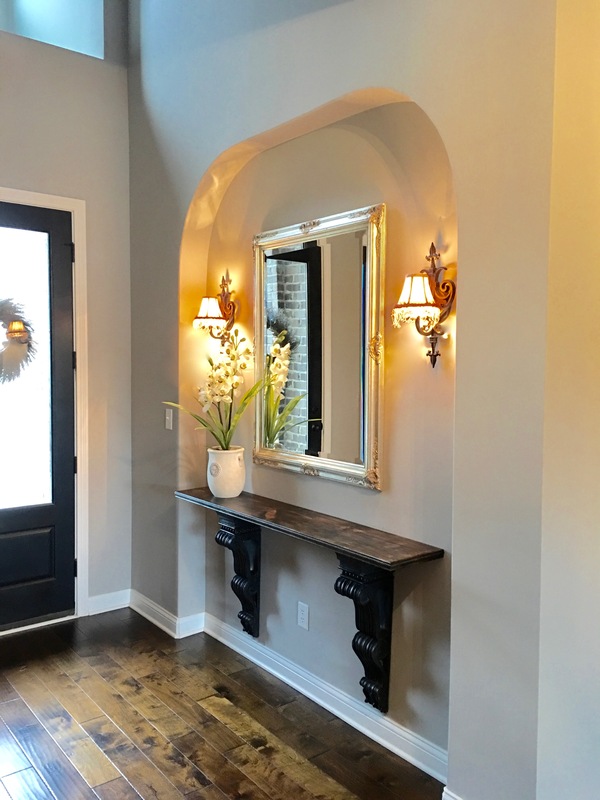 Adding an entry way table, if the space is available, is a very welcoming addition to your space. It is so inviting and can be so personalized. No two entry tables really look the same. Everyone is different when it comes to table preferences and style themes throughout the home. They can be functional or just for looks. There are a few factors that go in to choosing the perfect table. Location, function and space availability are the three that set the course for mine. Mine is just for looks. I wanted a table that would make the space beautiful, that would feel warm and inviting and that I could decorate in a simple, yet elegant way. We built this home about 2 1/2 years ago and the home plan called for a niche in the entry way. A niche is a shallow recess in the wall meant for display. When building this house I knew that I wanted to hang sconce lighting in this space for added warmth so I had them prewired for that purpose. Our entry way is two stories but is not very wide. When I stand inside the front door I can just about touch the walls if I spread out my arms so it’s a little over 5 feet wide. That makes it challenging when trying to decide on a table for that space. I have looked around and could never find the right table. I had a vision for this entry way when we built the house and I wanted to build the table but the truth is that it is a lot easier to be lazy. Every time I found one that I kind of liked, there was something about it that was not going to work. Too long, too deep, too short, too shallow, too curvy, too straight….and so on. All along I have had it in my mind that I would build the table out of these corbels that I already had. I bought them at Hobby Lobby about a decade ago. But, you can find them all over if you scour the internet. I found these and I am obsessed! I love that they are really substantial. By using these I would be able to have a table completely against the wall. With a prebuilt table the legs would run into the baseboard and decrease my allowed surface area which meant that either the table would stick out more than I wanted or I would have to find a really skinny table. Building it would also allow me to build the exact measurement that I want for the length. I wanted it to take up almost all of the 75″ available to me. I could also be in charge of the color. I waited so long to do this project because I thought that I would find something that would speak to me (and I was being lazy). After a 2 and a half-year search, nothing called out to me. I hung the mirror two years ago and I was tired of looking at the empty space that made it feel like we haven’t finished moving in.So, I woke up one morning and I just did it!!! The hardest part was getting started. That’s the hardest part any time you have to do what seems to be a difficult task or would require more energy than you think you have available at the moment. I had also been trying to decide what color to paint the corbels and how I wanted this piece to look for a long time. I finally decided on aged black corbels and a wood top. I could have gone in so many directions because this is a completely customizable piece. I chose black because my front door is black both on the inside and outside. Also, the color of the iron in the lighting is dark, this space gets so much light and because the artwork frames in that area are black. Deciding if it should all be painted black or not was another choice I had to make. I ended up wanting the top stained in an espresso. I had an 8′ x 12″ pine board in the garage. I think that I purposely bought it for this project a year ago but can’t remember because 1. it has been a year and 2. I have so much wood in the garage from a bunch of other projects that I just wasn’t sure. I just used it anyway because it fit my need at that particular moment. I also bought a trim piece that was 8′ long that had a beaded detail. I wanted that to mimic the little beaded detail on the corbels in the top. I measured and cut the board to the width that I wanted. I then mitered the trim piece and secured it to the board on 3 sides with wood glue and a brad nailer. A larger nailer with a higher gauge nail would have split the wood since it was so small and delicate. I painted both corbels in a dark gray. I wanted to mostly cover the brown, but left a little peeking through. I then used a black paint over the gray. This milk paint dries really fast so I was able to move quickly through the layers. While that was drying, I stained all of the wood using an espresso stain from Minwax. While the wood top was drying, I then went back over the corbels with an antiquing wax working it into all of the grooves and wiping excess off. What a difference the black paint and wax makes! After the wax sets up a little, then you buff the wax and that is when it takes on a beautiful shine. I measured and leveled the screws for the corbels. I attached D-rings to the back of the corbels so I could have more control over the measurements for leveling them out. I could control exactly where they would hang and it would be easier to level. After leveling them and attaching the screws to the wall for installation I simply hung the D-rings on the screws. I then added Gorilla Glue to the tops of them and attached my table top. The whole project from beginning to end took me the better part of a day. Thankfully, with all of the knowledge I have from the craft room, I was able to easily whip this out. I wish that I had just done it sooner. It reminded me that the hardest part is starting and it isn’t as hard as you have something made out to be in your head. When it came to styling I didn’t want to overwhelm this small space. I kept it simple and used the rule of three. I chose a beautiful oversized plant and 2 frames. Now this space is welcoming and inviting. In the evenings, when the lights are on, there is a soft glow and beauty greets you when you walk in the front door. I LOVE this entry so much now. It really added some life and warmth to the space! What are some creative things YOU have done with YOUR entry way? I would love to hear about them! Previous Post Thoughtfully Lovely? What’s behind the name? Next Post Craft Room Part 6 | The Reveal!!! Gorgeous! On an unrelated note, can you please tell me what wood/stain/any other details your breathtaking floors are? I am in love! Hi, Erin! Welcome and Thank you!! Yes, I think our floors are hand-scraped walnut 5″ wide plank floors from BellaCera. They were the choice from our homebuilder when we built our home. It is an engineered hardwood and I love them. They don’t warp when they get wet, either. I really love them!! !